I love going to the beach with my chocolate lab, Archer. With the exception of fighting for a parking space, I love everything about it. The excitement of Archer jumping in the surf, the sand between my toes, the smell of the sea air and the taste of the saltwater on my lips. But that saltwater can pose dangers for your dog if they take in too much. Recently, a pet lost their life here in our area after taking in too much saltwater during a trip to the beach. The dog had been to the beach with his owner on many occasions in the past with no ill effects, but this time the trip was fatal. A few days after his beach trip, the dog was suffering from diarrhea, lethargy and showed signs of confusion. By the time the pet made it to the emergency hospital, it was too late to save him. 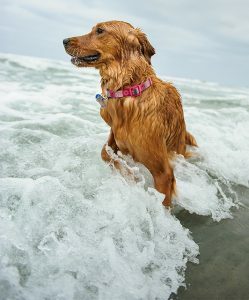 It was a very unfortunate incident, and I want to share some tips with you to keep your pets safe if they enjoy playing in the surf. 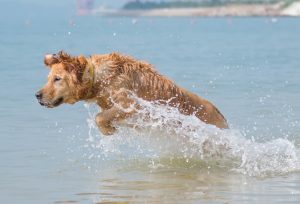 Even if your pet isn’t deliberately drinking saltwater while at the beach, they can still ingest large amounts of it when swimming or chasing their favorite toys in the surf. Your dog’s body is just like ours- we need to regulate the amount of sodium that is in our system. When there’s too much of it, our cells can’t hold as much water. In severe cases, too much salt in the system is known as hypernatremia- and it could be fatal if not diagnosed in time. If your pet experiences any of these symptoms within 48 hours of going to the beach and playing in the water- seek veterinary help for your pet immediately. Time is of the essence! When you take your pet to the beach, it is important to take lots of fresh water with you. Make sure that you also have a bowl for them to drink from- there’s lots of great collapsable plastic bowls available now. Take plenty of breaks from the water for them to rest and drink fresh water. Invest in an umbrella or something to provide shade for your pet on hot days when the sun is blazing. Running and playing on the beach is great exercise for your pet, and your pet needs to take in even more fresh water than usual when they are exercising. For other tips on keeping your pet cool and safe this summer, check out my blog on this topic here. Salt-chlorinated pools don’t pose as great a threat as the ocean. The salinity of a ‘saltwater’ pool is about 1/10th that of the ocean. The equipment for these pools converts the salt into chlorine. We don’t recommend that your pet drink it, but the salt level is not really harmful in small quantities.